If you’re ready to make the switch to solar power, give us a call today! Otherwise, continue reading to learn more about how renewable energy, smart grids, and solar energy systems can help your energy consumption! A renewable energy source is a resource that can be used for energy and replenishes itself naturally. For example, wind, water, and solar are three commonly known renewable energy sources. As this relates to West Coast Solar, we install solar power systems to harness the rays of the sun and convert that energy into usable power for homes, cars, appliances, lighting, and more. The great part about the sun is that it’s virtually undepletable. Why make the switch to a renewable energy source? Renewable energy sources are more responsible and effective than non-renewable ones when it comes to mitigating or removing pollution emissions altogether. The average household emits nearly 20 metric tons of carbon per year with fossil fuel energy use. Replace fossil fuels with renewable energy, and the amount of pollution emitted drops substantially, and nearly disappears entirely. What is a solar power system? At West Coast Solar, we believe in renewable energy and offer solar power systems to residents and businesses in Sacramento and San Jose. A solar system allows for the collection of sun rays and converts them into usable energy for a home or business. You can use solar energy for your appliances, car, lights, heating/cooling, and so much more. Solar panels are installed on a roof or somewhere on a property with a lot of available sunlight. The panels then collect the sun’s energy and send it to an inverter, which converts the sun’s direct current (DC) energy to alternating current (AC), which is then sent to the electrical utility box for use in the home or business. In most solar systems, a battery bank is installed to store unused energy for later consumption during peak hours or power outages. The entire solar energy system allows for energy independence, reduces home carbon emissions substantially, and helps save money on utility bills. How does a smart grid and solar power system work together? If you have access to a smart grid and utilize solar panels to power your home, you have a unique opportunity to completely control your energy consumption in an effective, efficient, and responsible manner. 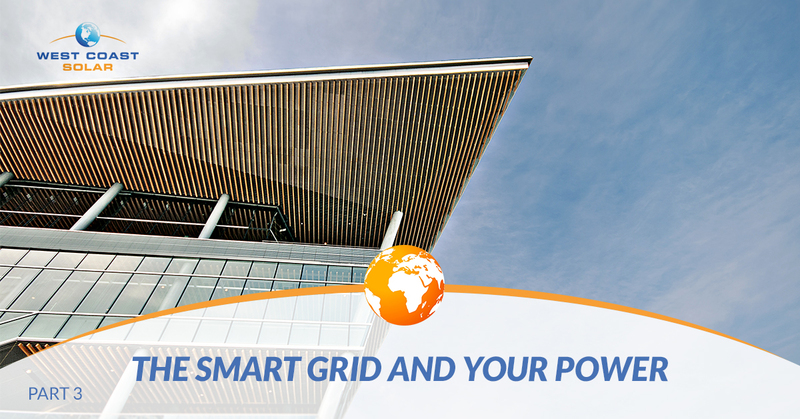 A smart grid allows for the control of energy to and from your home remotely through your phone or computer. A solar power system allows you to generate your own energy via the sun. Pair these two applications for renewable energy use together, and you’ll find utility bill savings, a reduction in carbon emissions, and a cleaner future for your loved ones at the tap of a button on your phone. As you monitor and regulate your energy use through your phone or computer, you can make energy use decisions based on price, consumption, needs, and more. This leads to a lower cost in electric bills and an increase in control. Why make the switch to solar power? One of the biggest reasons to make the switch to solar power is the opportunity for savings on your utility bills. When you produce your own energy, you can use and store it on your property. You can avoid peak hours when purchasing it from the grid costs the most. The second biggest reason to make the switch to solar is to reduce your home or business’s carbon emissions, which helps create a better future for you, your family, and your community. West Coast Solar: Call to discuss your solar power system! There’s nothing more important than the future of your loved ones. When you make the switch to solar power, you gain energy independence, a cost reduction on your utility bills, and an increased influence to help heal the environment. You gain back control with smart grids, smart homes, and solar power systems. You take advantage of an opportunity more people all over Sacramento, San Jose, and California are investing in every day. It’s a chance to control your energy use and determine your future. You can go back and read part two or continue reading this blog series with part four. Ready to install solar panels on your home or business? Give us a call today!